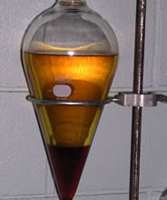 The purpose of this lab is to calculate the Kd of benzoic acid in dichloromethane. Don’t even worry about what that means yet. First let’s talk about what extraction is and how to use a sep funnel. At the end of this guide I'll show you the sample calculations involving the distribution coefficient, Kd. Extraction is a quick way to purify the product(s) of a reaction Most organic compounds are much more soluble in organic solvents (ether, dichloromethane, etc.) than they are in water. This is because of the “like dissolves like” rule. Likewise, most salts are much more soluble in water than they are in organic solvents. But just like oil and water will not mix together, most organic solvents will form layers when mixed with water. Two liquids that can mix together are said to be miscible. Most organic solvents are immiscible with water. We can use these facts to our advantage to purify the products of a reaction. 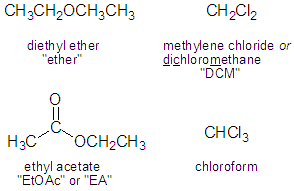 Let’s say you did some reaction and got the following compounds as your products, and let’s say A is the product we want. You can clean it up quickly by transferring your reaction into a separatory funnel (“sep funnel”) and adding some water and an organic solvent. After shaking the sep funnel for a moment, compound A will dissolve in the organic layer and salts B and C will dissolve in the water layer. The organic phase and aqueous phase form layers in your sep funnel. The less dense phase will be the top layer- most organic solvents are less dense than water. The only real exceptions you have to know about are halogenated solvents such as dichloromethane and chloroform- these are denser than water and so will always be on bottom. Let’s say you did the extraction above using ether. That means the water layer would be on bottom- you can just drain it off. Salts B and C will wash away with the water while compound A remains in the ether. Usually you wash more than once- so after draining off the aqueous layer, add some more water to the sep funnel and wash/rinse/repeat. Note: BE SURE to remove the top sep funnel cap before you drain! So now you’re left with a solution of compound B in ether. How do you get it out? 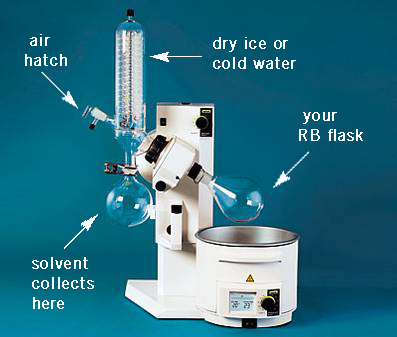 You transfer the ether to a pre-weighed round-bottom flask (RB flask) and place it on the rotary evaporator (“rotovap”). The rotovap works by lowering the pressure inside your round-bottom flask, allowing the a solvent to boil off at room temperature. After the ether boils away you are left with solid compound A.
Salts, or anything with a charge, is going to dissolve in the aqueous phase. Most other things will dissolve in the organic phase. For example, benzoic acid is much more soluble in organics than it is in water. But its charged sodium salt is soluble in water. How to tell if a compound is a salt you ask? If you see a charge or if you see a row I metal (Li, Na, K) then it’s a salt. Be Sure to Vent the Sep Funnel! As you shake the sep funnel it’s normal for a gas to build up- for example, some solvent evaporates, or you’re using sodium bicarbonate and carbon dioxide forms. So be sure to vent your sep funnel every few shakes! You do this by spinning the stopcock to let a little air out. Failure to do this is a safety hazard; the cap would burst off your sep funnel. To do an extraction you need to use an organic solvent that is not miscible with water, or else you won’t get any layers to separate. A few common organic solvents are miscible with water so can’t be used for an extraction. The product you want to isolate can’t be soluble in water ether. Most organic products aren’t, but it’s possible that a compound is so polar that it’s soluble in water. How to tell? If the compound has lots of polar groups, such as hydroxyl (-OH), it might be soluble in water. The rotovap is glass under pressure, so always wear goggles- there’s a slight chance the glass could shatter. The round bottom flask shouldn’t be more than ~40% full of solvent or else you will get “bumping” (solvent slashing around- you’ll lose product this way). Before you turn on or turn off the vacuum open the hatch to allow air into the system. Otherwise your solvent might get sucked into the vacuum, which is bad for you and the equipment. As mentioned above, benzoic acid is more soluble in organic solvents, such as dichloromethane (DCM), than it is in water. So if we have a solution of benzoic acid in water, which is the more efficient way to extract it: doing a single extraction using 10 mL of DCM, or two extractions, each using 5 mL of DCM? By the rule “the correct answer will keep you in orgo lab longer”, it’s the second choice- two 5 mL extractions. The purpose of this lab is to do the experiment and subsequent calculation to prove this fact. I’m going to go through all of the math after I describe the procedure. You’re going to use a 0.020 M solution of benzoic acid (BzOH) in water and a 0.020 M solution of sodium hydroxide (NaOH). You will probably have to make the benzoic acid solution yourself, but the NaOH solution will be provided for you. First extraction: in a sep funnel add 50.0 mL of the aqueous benzoic acid solution and 10.0 mL dichloromethane (DCM). Shake and drain off the lower DCM layer. Now titrate the aqueous layer with NaOH to determine how much benzoic acid remained in the water. Using this data you can calculate Kd. Second extraction: extract 50.0 mL aqueous benzoic acid with two 5.0 mL portions of DCM. After the second extraction drain off the lower DCM layer and once again titrate the aqueous layer to determine how much benzoic acid remains. 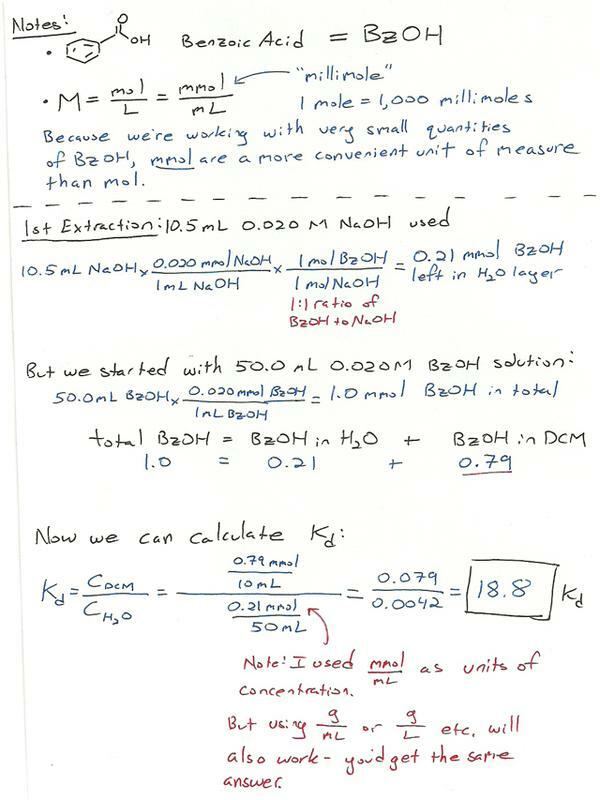 (It should be less than after one 10.0 mL extraction) Compare the actual amount of benzoic acid remaining with what you expect from the Kd calculation. Q: For most organic compounds would you expect the value of Kd to be greater than or less than one? A: The dissociation constant is defined as the ratio of the amount of compound in the organic phase to the amount of compound in the aqueous phase. Since most organic compounds are more soluble in organic solvents than they are in water, you would expect the value of Corganic phase to be much larger than the value of Caqueous phase. Because the numerator is large and the denominator is small, Kd should always be more than 1. Q: Both benzoic acid and ethyl benzoate are soluble in organic solvents. How can you use extraction to separate them? A: By doing an extraction with an organic solvent (ether, DCM etc.) and an aqueous solution of a weak base such as sodium bicarbonate. Remember: salts are water soluble. So if we add an aqueous solution of sodium bicarbonate to deprotonate the benzoic acid, the resulting sodium salt (the conjugate base of benzoic acid) will stay in the water layer. Because ethyl benzoate has no acidic protons, it won’t react with the sodium bicarbonate and will remain in the organic layer.